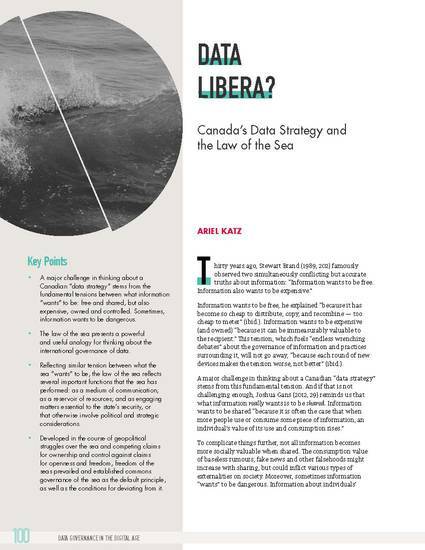 This essay, part of “Data Strategy in the Digital Age—Special Report”, a collection of essays commissioned by the International Law Research Program at the Centre for International Governance Innovation (CIGI), exploring topics including the rationale for a data strategy, the role of a data strategy for Canadian industries, and policy considerations for domestic and international data governance. The essay notes that a major challenge in thinking about a national and international “data strategy” stems from the fundamental tensions between what information “wants” to be: free and shared, but also expensive, owned and controlled. Sometimes, information “wants” to be dangerous. Contemporary discourse around the governance of information often refer to data as “the new oil” or “the new gold”. These metaphors imply ownership and exclusive control and emphasize the money that can be made by those who control data—the private benefits that they might derive from its exploitation, not the aggregate value shared by society as a whole—while ignoring that much more is at stake. The essay suggests using a better metaphor: data as “the new sea.” Unlike oil or gold, but like the sea, data and information are non-rivalrous resources that can be used simultaneously by everyone without being diminished. Built around similar tensions between what the sea “wants to be”: free, shared and open; expensive and owned; empowering and dangerous; the law of the sea and its historical development provide a useful framework for thinking about the national and international governance of data.